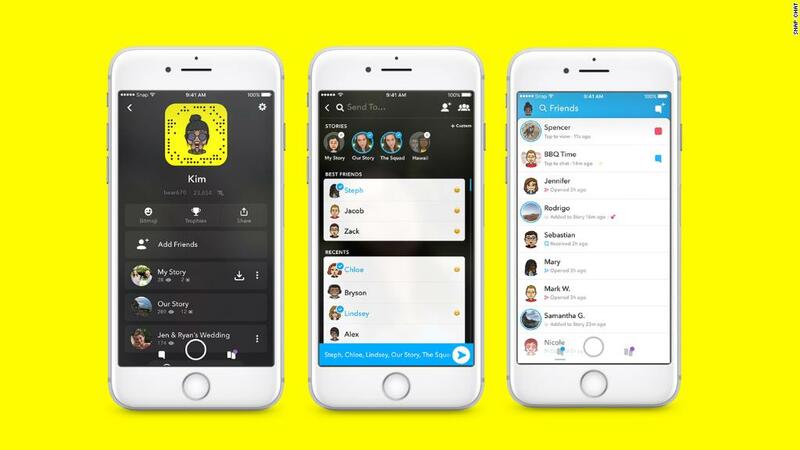 Will a redesign help woo new Snapchat users? More than one million people have signed an online petition calling for Snapchat to scrap its new redesign. But Snapchat's top exec sounds unfazed. Evan Spiegel, the CEO of Snapchat (SNAP)'s parent company, said Thursday that some user complaints about a major redesign actually "validate those changes." "One of the complaints we got is, 'Wow, I used to feel this celebrity was my friend and now I don't feel like they're my friend anymore,' " Spiegel said on stage at the Goldman Sachs Technology and Internet Conference. "Exactly. They're not your friend." The app previously featured content from friends, publishers and celebrities on one page. Now, there's a designated page for publishers and famous people, and a separate page for friends. Spiegel announced the Snapchat redesign in November. The company's goal was to make the app easier to use after struggling to grow its audience for much of 2017. But now Snapchat is facing criticism that the app reorganization makes it harder to navigate. Among the complaints: disappearing posts are mixed in with direct messages; updates from friends you contact less frequently are harder to find; and posts shared by celebrities are separated from posts shared by friends.
" ... I no longer feel like Chrissy Teigen is my close personal friend," one Snapchat user wrote on Twitter. "Nothing feels the same. I hate u Snapchat." The move was part of a deliberate strategy to set Snapchat apart from rivals like Twitter (TWTR) and Facebook (FB)'s Instagram. "One of the complaints we've heard about social media is that photos and videos from your friends are mixed in with content from publishers and creators and influencers," Spiegel said in November. "But your friends aren't content, they're relationships." "Even some of the complaints we're seeing reinforce the philosophy," Spiegel said Thursday. The app redesign had rolled out to 40 million users as of earlier this month. It will be available to all users by the end of this quarter. Snapchat currently has 187 million daily active users. It does not disclose its total user base. -- Kaya Yurieff contributed to this report.